Let's call this thing what it is, The Macondo Oil Volcano. Thank you John, for your untiring attempt to provide a scientific basis of the documentation of the surface imagery. I understand the challenges of gathering this data in the presence of continually changing weather patterns. Are you aware if there is a government agency collecting similar information? And has there been attempt to integrate the ongoing interpretation of the snapshots to better constrain the limits of total sheen coverage versus the thicker extents of the spill? Thanks again for the great work. Every day I check this site and theoildrum.com , the latter being a site in which pros in the drilling industry usually discuss Peak Oil issues, but lately try and figure out what BP is doing and if it'll work. The only thing most think WILL work is a relief well in… this boggles the mind – August or September. Going to report live at 4pm! Chris – The Oil Drum is a great resource. Phil – NOAA is getting multiple images daily from a variety of civilian and foreign-government-operated radar and visible to infrared satellite systems; they may also be getting data from national assets ("spy satellites"). 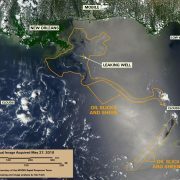 NOAA is also flying aerial photography surveys, and they are using some NASA airborne sensors to get more direct measures of oil thickness: the official Flow Rate Technical Group made their spill rate estimate a few days ago partly based on a transect of AVIRIS hyperspectral data flown on May 17. 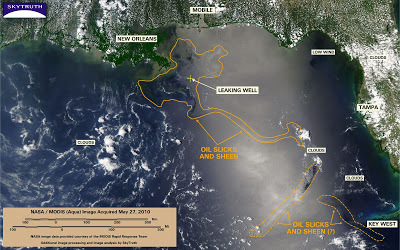 They extrapolated that profile to the entire slick that day, then (with no explanation) assumed that 50% of the oil spilled since April 20 was observable in that slick on May 17, and 50% was not (still underwater, evaporated, biodegraded, skimmed, burned, etc.). Maybe some day we'll get access to this growing mountain of remote-sensing data, which can help tell the story of the surface impacts of this spill. The 800-pound gorilla in the room: how much oil is underwater, out of sight? Where is it going, and what is it doing? We need a full-on science, engineering, and political press to get the research underway ASAP to figure that out. Joe – sadly, I think this could get even worse if we lose the wellhead and blowout preventer from the runaway Macondo well. So I'll hold your label in reserve, should that unhappy event come to pass. But then I'll call it the BP Oil Volcano to indicate exactly who owns this fatal and tragic mess. To fear oil spills from offshore rigs today is analogous to fearing air travel now because of prop plane crashes. Mac – in that same vein, I'd like to see someone put the BP leak video to music. I propose Jimi Hendrix — Purple Haze or maybe Stone Free.